The increasing number of methods available for schema matching/ontology integration necessitate to establish a consensus for evaluation of these methods. 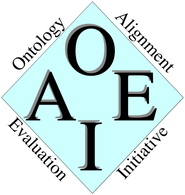 Since 2004, OAEI organizes evaluation campaigns aiming at evaluating ontology matching technologies. The OAEI 2009 campaign is associated to the ISWC Ontology matching workshop to be held at Fairfax (VA US), near Washington DC on Sunday October 25, 2009. The 2009 campaign introduces two new specific tracks involving oriented matching, i.e., results with subsumption-like relations, and instance matching, i.e., results whose goal is to match instances and not classes. Like in previous campaigns, a systematic benchmark series has been produced. The goal of this benchmark series is to identify the areas in which each alignment algorithm is strong and weak. The test is based on one particular ontology dedicated to the very narrow domain of bibliography and a number of alternative ontologies of the same domain for which alignments are provided. The anatomy real world case is about matching the Adult Mouse Anatomy (2744 classes) and the NCI Thesaurus (3304 classes) describing the human anatomy. Participants will be asked to find all correct correspondences (equivalence and/or subsumption correspondences) and/or 'interesting correspondences' within a collection of ontologies describing the domain of organising conferences (the domain being well understandable for every researcher). Results will be evaluated a posteriori in part manually and in part by data-mining techniques and logical reasoning techniques. There will also be evaluation against reference mapping based on subset of the whole collection. features four different classification schemes, expressed in OWL, adopted by different fishery information systems in FIM division of FAO. An alignment performed on this 4 schemes should be able to spot out equivalence, or a degree of similarity between the fishing gear types and the groups of gears, such to enable a future exercise of data aggregation cross systems. The directory real world case consists of matching web sites directories (like open directory or Yahoo's). It is more than 4 thousand elementary tests. Three large SKOS subject heading lists for libraries have to be matched using relations from the SKOS vocabulary. Results will be evaluated on the basis of (i) a partial reference alignment (ii) using the mapping to re-index books from one vocabulary to the other. This track focuses on the evaluation of alignments that contain other mapping relations than equivalences. The instance data matching track aims at evaluating tools able to identify similar instances among different datasets. It features Web datasets, as well as a generated benchmark. A generated benchmark constituted using one dataset and modifying it according to various criterias. The purpose of this task (vlcr) is to match the Thesaurus of the Netherlands Institute for Sound and Vision (called GTAA, see below for more information) to two other resources: the English WordNet from Princeton University and DBpedia. [0 1] in the 'confidence-column' means that submission with confidence values in the range [0 1] are preferred, but does not exclude systems which do not distinguish between different confidence values. results are evaluated by using them in a final task and evaluating the impact in this final task. However, the evaluation will be processed in the same three successive steps as before. Ontologies are described in OWL-DL and serialized in the RDF/XML format. The expected alignments are provided in the Alignment format expressed in RDF/XML. The ontologies and alignments of the evaluation are provided in advance during the period between May 19th and June 15th. This gives potential participants the occasion to send observations, bug corrections, remarks and other test cases to the organizers. The goal of this primary period is to be sure that the delivered tests make sense to the participants. The feedback is important, so all participants should not hesitate to provide it. The tests will certainly change after this period, but only for ensuring a better participation to the tests. The final test base has been released on July 1st. The deadline for delivering final results is September 26th, sharp. However, it is highly advised that participants send results before (preferably by September 1st) to the organisers so that they can check that they will be able to evaluate the results smoothly and can provide some feedback to participants. All participants are required to provide a link to their program and parameter set. This year, we would like this to collect the requirements of all your tools in order to have an idea of what it would require to offer you automatic evaluation in the years to come. Appart from the instance matching track, the only interesting alignments are those involving classes and properties of the given ontologies. So these alignments should not align individuals, nor entities from the external ontologies. The organizers will evaluate the results of the algorithms used by the participants and provide comparisons on the basis of the provided alignments. In order to ensure that it will be possible to process automatically the provided results, participants are requested to provide (preliminary) results by September 1st. In the case of blind tests only the organizers will do the evaluation with regard to the withheld alignments. In the case of double blind tests, the participants will provide a version of their system and the values of the parameters if any. An email with the location of the required zip files must be sent to the contact addresses below. The standard evaluation measures will be precision and recall computed against the reference alignments. For the matter of aggregation of the measures we will use weighted harmonic means (weight being the size of reference alignment). Precision/recall graphs will also be computed, so it is advised that participants provide their results with a weight to each correspondence they found (participants can provide two alignment results: <name>.rdf for the selected alignment and <name>-full.rdf for the alignment with weights. Furthermore, it is planned to introduce new measures addressing some limitations of precision and recall. These will be presented at the workshop discussion in order for the participants to provide feedback on the opportunity to use them in a further evaluation. final results ready and OM-2009 workshop. participants send final versions of papers to Jérôme Euzenat and Pavel Shvaiko. From the results of the experiments the participants are expected to provide the organisers with a paper to be published in the proceedings of the workshop. The paper must be no more than 8 pages long and formatted using the LNCS Style. To ensure easy comparability among the participants it has to follow the given outline. A package with LaTeX and Word templates is made available here. The above mentionned paper must be sent in PDF format before September 28st to Jerome . Euzenat (�) inrialpes . fr with copy to Pavel Shvaiko (pavel (�) dit dot unitn dot it. Participants may also submit a longer version of their paper, with a length justified by its technical content, to be published online in the CEUR-WS collection and on the OAEI web site (this last paper will be due just before the workshop). (not necessaryly by putting the section below but preferably in this order). These papers are not peer-reviewed and are here to keep track of the participations and the description of matchers which took part in the campaign. The results from both selected participants and organizers will be presented at the Workshop on Ontology matching at ISWC 2009 taking place at Chantilly (VA, USA) near Washington DC on October, 25th, 2009. We hope to see you there. Here are some tools that may help participants. Participants may use the Alignment API for generating and manipulating their alignments (in particular for computing evaluation of results). The participants may use various options if they need to convert SKOS vocabularies into OWL. Vassilis Spiliopoulos pointed out to Altova transformer from OWL to N3 notation. This can be useful for some. This is a commercial tool with a 30 days free trial.